Haifa University Library. Photo by Jenny Carmel. We have the confirmation of another governor of the province of Judea. It appears that some news reports have given the impression that this is the first time we have heard of Marcus Paccius Silvanus Quintus Coredius Gallus Gargilius Antiquus. It is not the first inscription that mentions his name (this is acknowledged by the Phillippe Bohstrom's article in passing). However, there was some debate over where he ruled, either in Syria or Syria-Palaestina. Ameling and Dabrowa argue “it is more likely that Dor belonged to the province of Judaea/Syria Palaestina, and that the honorand was governor of Judaea.” This has now been confirmed with the discovery of the new inscription. 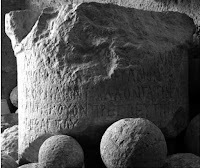 Recently (January 2016) a new Roman inscription (see Fig. 1) was recovered from off the coast of Dor by Haifa University underwater archaeologists. An inscribed circular stone was previously discovered in 1948, by the East Gate of the ancient city of Dor, during the Israeli War of Independence (SEG 37.1477; 41.1547; 45.1946). In 1978 it was again located in the same place and transferred to the Center of Nautical and Regional Archaeology at Nahsholim, where it is now on display (see Fig. 2). 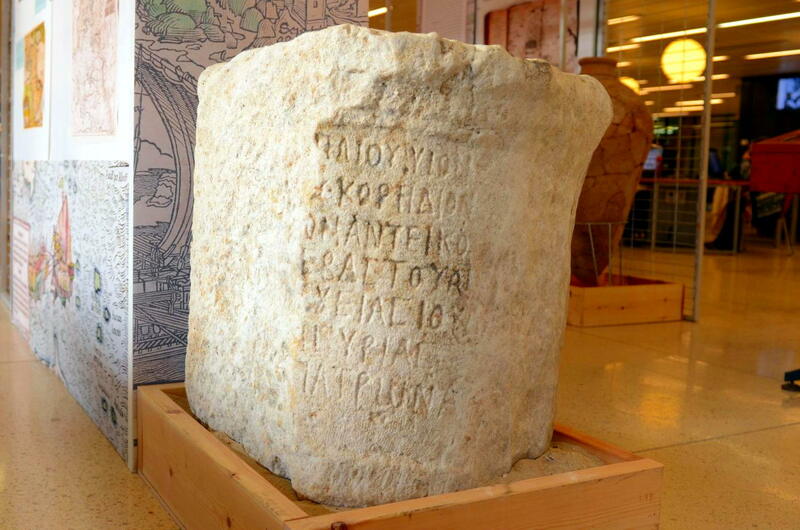 Gera and Cotton translated the Greek of the reconstructed circular stone inscription, discovered in 1947, as:. What do we know of Marcus Paccius Silvanus Quintus Coredius Gallus Gargilius Antiquus (Mark Paktsy Sylvan Quintus Coredo Gull Gargily Antiqua). His Father was Publius and a relative of Gargilius Antiquus from Africa (CIL 8.23246). Marcus Paccius was a Roman politician in the first half of the 2nd Century AD. He held the position of governor (consul suffectus) of the province of Arabia Petraea in approximately AD 116-119 and was confirmed at Dor between 122 and 125. It has now been confirmed that he was the governor of Judea. 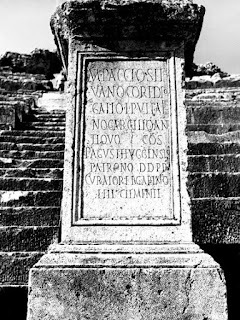 His son, Marcus Paccius Silvanus Goredius Lucius Gallus Lucius Pullaienus Gargilius Antiquus presumably was the consul suffectus in 161/162. His name appears on coins of Hadrianopolis, Perinthus, Philippopolis, Plotinopolis, and Pautalia. On the previous inscription mentioning Marcus Paccius Silvanus Quintus Coredius Gallus Gargilius Antiquus See this Image. Ferrell Jenkins' article and photos of Dor. 2). Walter Ameling et al., eds., Caesarea and the Middle Coast: Nos. 1121-2160, vol. 2, Corpus Inscriptionum Iudeaeae/Palaestinae (Berlin: Walter de Gruyter, 2011), 844; E. Dabrowa, “M. Paccius Silvanus Quintus Coredius Gallus Gargilius Antiquus et son cursus honorum,” in Nunc de suebis dicendum est: studia archaeologica et historica Georgio Kolendo ab amicis et discipulis dicata, ed. Aleksander Bursche and Jerzy Kolendo (Warsaw: Instytut Archeologii Uniwersytetu Warszawskiego, 1995), 99. 3). See the list in Wikipedia: Judea (Roman province). 4). First published in Hebrew in Qadmoniot 22 (1989): 42, but also found listed in the Dor inspection file (1951), of the Israel Antiquities Authority (IAA). 5). Dabrowa, “M. Paccius,” 99–102. 6). Philippe Bohstrom, “Divers Find Unexpected Roman Inscription from the Eve of Bar-Kochba Revolt,” Haaretz, November 30, 2016, n.p., http://www.haaretz.com/jewish/archaeology/1.756193. 8). See E. Stern et al. : Tel Dor 1986, Preliminary Report, Israel Exploration Journal 37 (1987), p. 209; E. Stern et al. : Tel Dor 1987, Preliminary Report, Israel Exploration Journal 39 (1989), p. 37. 9). Gera and Cotton, “A Dedication from Dor to a Governor of Syria,” 499 n.3. 12). On Gargilii Antiqui, see Ibid., 500 n.41. 13). William David Davies, Louis Finkelstein, and Steven T. Katz, The Cambridge History of Judaism: Volume 4, The Late Roman-Rabbinic Period (Cambridge University Press, 1984), 4:101; Dabrowa, “M. Paccius.” 99–102. 14). Bohstrom, “Divers Find Unexpected Roman Inscription.” n.p. 15). Bengt E. Thomasson, Laterculi Praesidum, vol. 1 (Londongatan: Göteborg, 2009), 65; 22:028. Ameling, Walter, Hannah M. Cotton, Werner Eck, Benjamin Isaac, Alla Kushnir-Stein, Haggai Misgav, Jonathan Price, and Ada Yardeni, eds. Caesarea and the Middle Coast: nos. 1121-2160. Vol. 2. Corpus Inscriptionum Iudeaeae/Palaestinae. Berlin: Walter de Gruyter, 2011. Bohstrom, Philippe. “Divers Find Unexpected Roman Inscription from the Eve of Bar-Kochba Revolt.” Haaretz, November 30, 2016. http://www.haaretz.com/jewish/archaeology/1.756193. Cotton, Hannah M., and Werner Eck. Governors and Their Personnel on Latin Inscriptions from Caesarea Maritima. Proceedings of the Israel Academy of Sciences and Humanities 7. Jerusalem, Israel: Israel Academy of Sciences and Humanities, 2001. Dabrowa, E. “M. Paccius Silvanus Quintus Coredius Gallus Gargilius Antiquus et son cursus honorum.” In Nunc de suebis dicendum est: studia archaeologica et historica Georgio Kolendo ab amicis et discipulis dicata, edited by Aleksander Bursche and Jerzy Kolendo, 99–102. Warsaw: Instytut Archeologii Uniwersytetu Warszawskiego, 1995. Daniel, Robert, Avner Ecker, Michael Shenkar, Claudia Sode, Marfa Heimbach, Dirk Koßmann, Naomi Schneider. Caesarea and the Middle Coast: 1121—2160. Walter de Gruyter, 2011. рр. 843—844. Davies, William David, Louis Finkelstein, and Steven T. Katz. The Cambridge History of Judaism: Volume 4, The Late Roman-Rabbinic Period. Cambridge University Press, 1984, page 4:101. Eck, Werner. “Ehrenstatuen Als Mittel Der Öffentlichen Kommunikation in Städten Der Provinz Iudaea/Syria Palaestina.” Electrum 21 (2014): 107–15. Gera, Dov, and Hannah M. Cotton. “A Dedication from Dor to a Governor of Syria.” IEJ 41, no. 4 (1991): 258–66. Sartre, M. “Inscriptions inédites de l'Arabie romaine.” Syria 50, no. 1 (1973): 223—33. SEG = Chaniotis, Angelos, Thomas Corsten, N. Papazarkadas, and Rolf A. Tybout, eds. Supplementum Epigraphicum Graecum. Leiden: Gieben, 1923. Stern E. et al. : Tel Dor 1986, Preliminary Report, Israel Exploration Journal 37 (1987), 209. Stern E. et al. : Tel Dor 1987, Preliminary Report, Israel Exploration Journal 39 (1989), 37.